Description: Number 131 out of 386 build in England by AC Cars LTD / Autokraft. 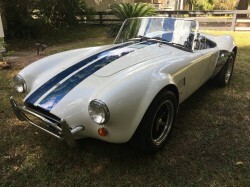 This is a real aluminum body Cobra not a kit car. This is a Ford product sold through a Ford dealership. Powered by a 5.0 HO Ford 302 V8 that has been modified. Mods include 8 Stack Fuel Injection by Borla which looks like a set of Weber carbs but with more performance, dependability and fuel economy, aluminum heads, shorty headers, performance cam, billet pulley system. Borg Warner 5 speed transmission. Salisbury differential. Adjustable coil spring suspension with GT40 shocks. Top, side curtains, tonneau, storage cover, MotoLita steering wheel and original leather steering wheel, head rest. Excellent condition with approximately 3840 original miles. Runs and drives like a new car. One of 183 built for the US market. Very desirable white with blue stripes and interior. Incredible paperwork including the original Ford window sticker, Bill of Sale, hand written dealer to manufacturer order sheet, MSO, manufacturer to dealer invoice, dealer odometer reading, owner's manual plus more. I am the second owner the first owner traded a Ferrari 246 Dino even for the Cobra. This is in the paperwork. This is a show quality, show winning car. Offers considered. Recorded in the Shelby American Auto Club (SAAC) and AC Owners Club (ACOC) registries. This is the REAL THING!